Mixxx is an open source DJ tool designed for both professional and amateur DJs alike.Mixxx allows DJs to mix music live with a clean, simple interface. Futhermore, Mixxx has a number of key features to help DJs in the mix: Beat estimation, parallel visual displays, and support for various DJ hardware controllers. * Fullscreen key changed to F11 to conform to de-facto standard. * Tons of other bug fixes! Since everyone's been waiting ever so patiently for this release, we decided to slip a bonus in for you. 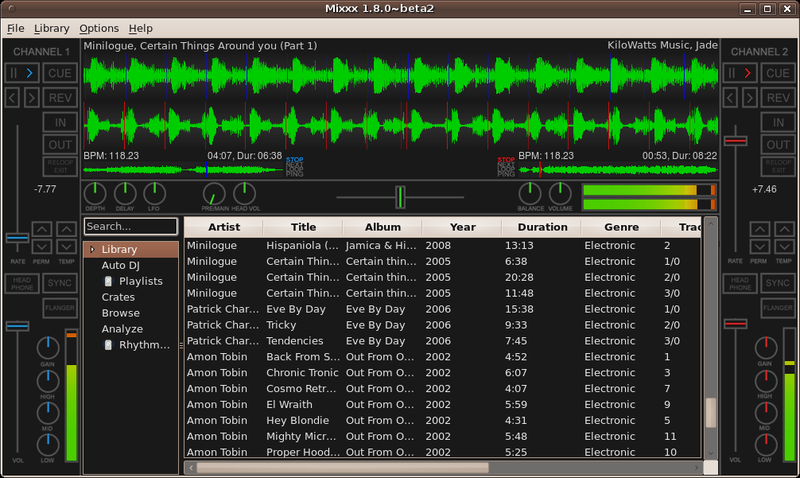 Mixxx 1.8.0 Beta 2 adds hotcues, which are cue points that start playing when triggered. These are handy for impromptu drumming and remixing because you can trigger different parts of a song quickly. Although our default "Outline Netbook" skin doesn't yet show the hotcue positions on the main scrolling waveform display, the hotcues do show up in the smaller waveform summary. The new audio playback plugin framework lets you to install third-party plugins that give Mixxx the ability to playback extra audio formats. Sometimes support for an obscure audio format is difficult to maintain or may be legally encumbered in certain jurisdictions, either of which would preventing us from supporting it. However, third-party developers can now add support for extra audio formats to Mixxx at their own discretion. The Mixxx Development Team will not distribute audio playback plugins that carry legal uncertainty for us. The responsibility is solely yours to ensure that you are legally entitled to obtain and use any playback plugins provided by a third-party. Although we don't have any official audio playback plugins available yet, we'd like to invite developers to post their plugins on the Mixxx Add-ons wiki page.